Synthetic biology—which involves engineering biological systems for new uses—has become an increasingly prominent, and promising, field of study in colleges and universities worldwide. Research has yielded, for example, viruses that attack harmful bacteria, yeasts that produce biofuels, and engineered microorganisms capable of detecting toxins in the environment, among many other innovations. Yet high school students rarely learn about synthetic biology at all, says Natalie Kuldell, an instructor of biological engineering at MIT. The issue, she says, is lack of accessible, hands-on curricula for such a rapidly developing field. "With subjects like physics, for instance, you can demonstrate engineering by building Rube Goldberg machines or model bridges," Kuldell says. 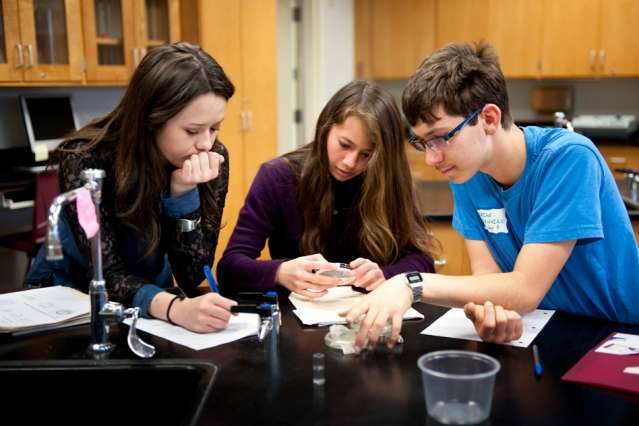 "But it's hard to think how to bring engineering to biology for high school students." In partnership with high school teachers, Kuldell launched the BioBuilder Educational Foundation in 2011 to provide schools with lab kits and lesson plans—adapted from her own MIT curriculum and MIT research labs—to boost interest and innovation in the field. Today, more than 400 teachers in 43 states are using the formal BioBuilder curriculum. Some have also adapted the coursework for middle school students. Many other teachers worldwide incorporate some of the material, which is freely available online, into their lesson plans. Recently, BioBuilder and Boston's Museum of Science received a National Science Foundation (NSF) grant to develop synthetic biology kits to send to more than 200 other museums around the country next summer. "It's certainly taken off," Kuldell says, adding: "Teachers love learning, and love teaching, and BioBuilder lets them do both." To use BioBuilder, students start off reading comic books and watching animations that present a specific research problem and experiment. Then it's off to the lab, where groups of students are provided kits to conduct their own experiments. BioBuilder offers five labs, which include engineering bacteria to emit specific colors or odors, or building circuits. Kits include all necessary tools and materials, such as droppers, centrifuge tubes, circuit parts, and bacteria such as E. coli to study. Teachers can decide which BioBuilder lessons to teach, and how. Some teachers run full semester-long classes, and some pick and choose a few lessons each year; others use it as an afterschool program or final project. David Mangus, head of a new biotechnology program at Brockton High School in Brockton, Massachusetts, has been using several BioBuilder lessons as well as the "Biology by Design" unit—where students must write mock grant proposals—as capstone projects. BioBuilder, he says, has shown students a new side of biology. "It's a different way of thinking about life," he says. "It's what we can do with it, instead of just experiencing it." A favorite lab among students, Kuldell says, is called "Eau That Smell," which involves examining bacteria engineered to smell like ripe bananas at a certain stage of their growth. Students must then modify the bacteria to emit that specific odor at different growth stages. "They do a lot of quantitative and qualitative measurements, start thinking about what data they believe, how to improve the system, and how to better engineer a system," she says. Many students also enjoy "What a Colorful World," a lab where students study E. coli programmed to change colors. In it, students must consider how different cellular chassis (structures) might be engineered to control the emitted color, "just as a car's chassis must be tailored to the engine it will house," Kuldell says. When the labs are complete, students may share any data through an online portal run by BioBuilder. Kuldell also hosts an afterschool BioBuilderClub for students and teachers around the world, where students can engineer their own biotechnology designs. Students also have the opportunity to present their work to each other and to synthetic biologists throughout the year. This encourages students to really get involved and "own their data," Kuldell says. Over the years, BioBuilder has served as a launchpad for notable projects and influenced the career choices of some students. Last year, a team of high school students from the Taipei American School in Taiwan used their BioBuilder classwork to engineer an extracellular protein that binds to and inhibits Granzyme B, an enzyme that causes tissue damage. For their project, the students won the grand prize for the high school track at this year's International Genetically Engineered Machine (iGEM) Competition in Boston, the world's top synthetic biology competition for college and high school students. At Brockton High School, sophomore Aysha Cheretakis, one of Mangus' students, has become a founding member of the school's BioBuilderClub, which is currently engineering an organism to detect Rohypnol (a drug commonly referred to as "roofies") in drinks, which they hope will be used in crime labs. Cheretakis became interested in synthetic biology after the "real-life laboratory experience" of BioBuilder's "What a Colorful World" lab. "It's not just stuff we read out of a book. In the lab we can apply our knowledge to the real world," she says. For Michael Sheets, a graduate of Tyngsborough High School in Tyngsborough, Massachusetts, BioBuilder was the gateway to studying microbiology at Olin College. The program, he adds, also gave him a "fantastic boost" in his college research: "The knowledge and skills I gained have stayed with me and been immensely useful in my education and internships since, and I'm sure will continue to aid me throughout my career." Kuldell launched BioBuilder as part of a NSF grant, called SynBERC, which provided 10 years of funding for synthetic biology research. The grant funded Kuldell's partnership with several area high school teachers who came to MIT for summer research. Together they developed an online educational platform for synthetic biology, based on research at MIT and elsewhere. Teachers who were interested in bringing those lessons to their labs and classrooms came to a professional development workshop at MIT and returned to their schools across the nation to pilot the program. Soon the BioBuilder curriculum and professional development program grew in popularity and Kuldell turned to the MIT Venture Mentoring Service (VMS) for support in launching the program as a nonprofit. Among other things, they helped Kuldell form BioBuilder's successful "training the trainers" model, where high school teachers not only learn the curriculum at workshops but also learn to teach the curriculum to other teachers at their own schools. "VMS were so important in helping me think about how to make something sustainable, how to speak about it, how to bring in partners, and develop partnerships," she says. "They were invaluable." Next up for Kuldell is establishing a teaching lab for BioBuilder at LabCentral, a shared incubator for biotech startups in Cambridge. BioBuilder recently moved headquarters there, after years of operating out of MIT's Department of Biological Engineering. The proposed BioBuilder@LabCentral Innovation Lab would help connect students and teachers with entrepreneurs in the area. She also hopes to launch a program there where community college students can fulfill part of a synthetic biology certificate program to help them land jobs at biotech firms. "The same way we make connections with teachers in middle and high schools, we hope to make connections with students to get them from coursework into careers," she says. Teachers and tech anywhere and anyplace – how to carry your classroom cloud! Can "smartboards" make high school students smarter?